In high school, Vivian Rodriguez was pretty sure she wanted to be an ultrasound technician.“I wanted to be able to tell the parents whether the baby was a boy or a girl!” However, when she heard that it was the doctor who generally shares this information with parents, she changed her mind. But, she knew that she wanted to be a health care practitioner and help people. She started looking into allied health programs and decided that nuclear medicine technology was the field for her. She was fascinated by the ability of nuclear medicine to provide unique information about the structure and function of virtually every major organ system within the human body, setting it apart from other types of imaging. 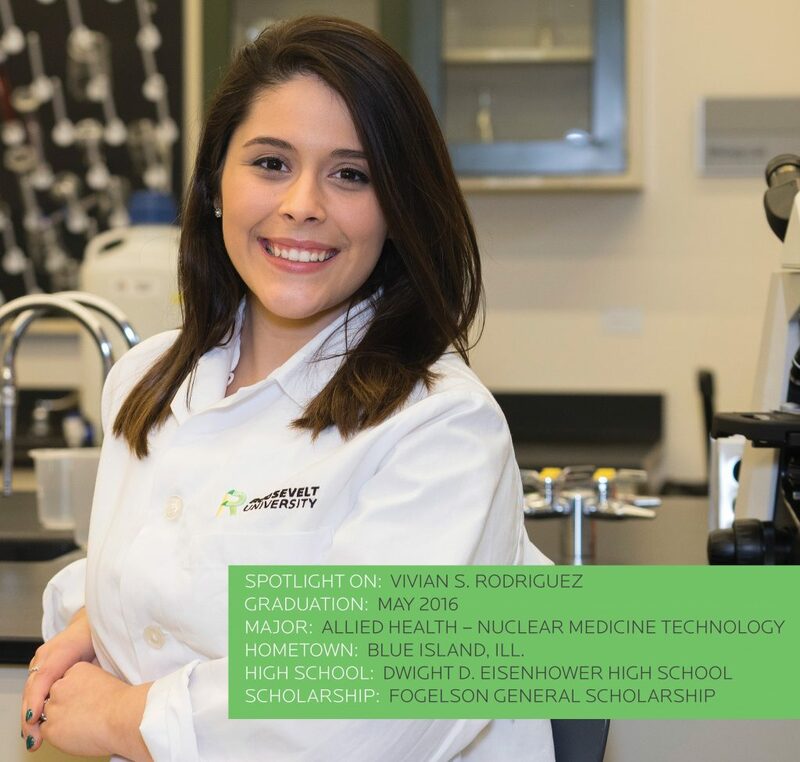 Today, as a Roosevelt University student, Vivian performs clinical hours at Northwestern Memorial Hospital, helping physicians characterize and quantify physiologic function at the molecular level by administering radioactive nuclides for disease diagnosis and, in some cases, therapy. A few years ago when she and her family visited and toured Roosevelt’s Chicago Campus, she knew that this is where she wanted to be. And once her dad saw the Wabash Building and her reaction to the possibility of living and studying there, he made the decision that he would not deny her the opportunity to do so. Rodriguez was an excellent student and talented athlete at Eisenhower High School in Blue Island, Ill.She was also an active participant in show choir, concert choir, band (she plays trumpet) and mathletes. And, she did all this while working part-time for her dad in his restaurant in Blue Island. When she arrived at Roosevelt, she worked as a student ambassador in the Office of Admission for her first three years. “Now as a senior, I work for the Athletics Department. With my clinical hours at the hospital, I needed evening hours,” she explained. She also has held multiple positions within her sorority, Alpha Gamma Delta. She played on the Roosevelt women’s tennis team as a sophomore and was the team captain last year. One of the things that Rodriguez has enjoyed most while studying at Roosevelt is the diversity of the student body. “I love getting to know people from all over the country.” In her studies at Northwestern Memorial, she has enjoyed learning about all of the rare diseases that are diagnosed using her discipline. When she graduates, she hopes to find a job at a Chicago area hospital with Northwestern Memorial and Central DuPage being her top choices. She’s grateful for everyone at Roosevelt who has supported her during the last four years, especially Trustee Gerald Fogelson, who funded her scholarship. “I’m starting a career helping people in a profession that I love. I’m appreciative for all the help that has allowed me to achieve this goal,” she said.